It’s always a nail-biting white-knuckled purgatory an adventure when I drive around certain areas of Central New York State. Take this morning, for example. I was only out and about for two hours or so, as the son had an appointment. Within that brief two-hour span, however, I gained 50 additional gray hairs and the poor son heard an earful. We risked our lives a mere three times JUST by driving 25 miles and back. Unfortunately, I wasn’t able to whip out my camera while dodging speeding bullets (aka, a 85-mph Mazda and a Hyundai SantaFe speeding through 40-mph zones) or averting catastrophes (such as truckers carelessly weaving in and out of tight traffic in a Road Work Zone). 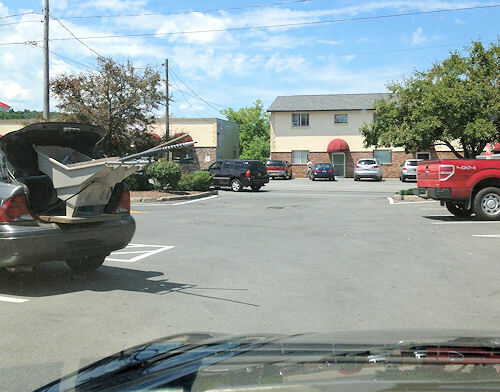 I did, however, manage to get one small photo shoot of a massive parking FAIL. “What’s what?” I said, my attention on the tailgating SUV monster breathing down my little Sonata neck. I screeched to a stop, closing the windows against the barrage of expletives bursting from the SUV. 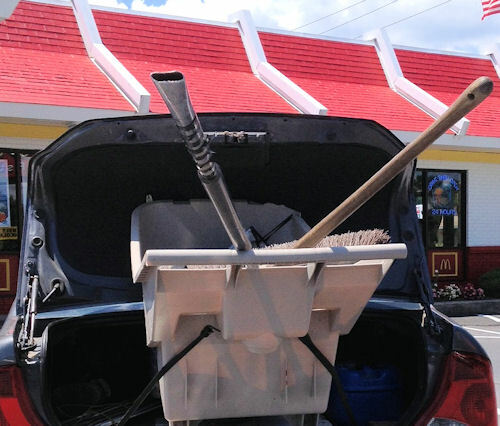 A car was parked in the tiny McD’s lot, and something was hanging out the back of the trunk. Can you see it? 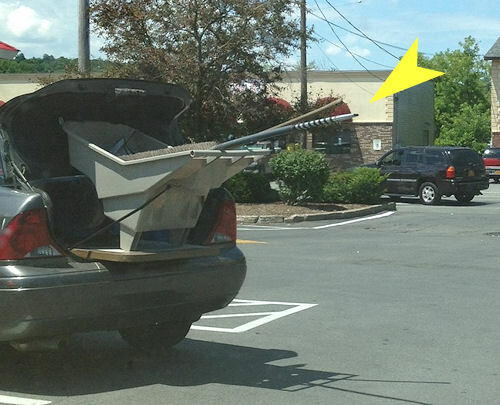 It was a wheelbarrow, loosely rigged to the trunk of a car, and a wooden broom handle and a METAL STAKE were sticking out the back, into oncoming traffic!! I am so glad my son was with me, because I would not have seen that until I was right on top of it.. or it through my windshield. Not 4 minutes after I pulled out of that parking lot to make a left-hand turn, another SUV roared up from behind me, crossed the yellow-double line in the center of the road, and passed me on my left to beat me to the left-hand turn. So now you know, dear friends, why I say I hate going out to shop, why I hate the traffic around here. People are NUTS. Oh man, I hear ya on everything you brought up. The bath salts, so weird. And the “spice” they are using too. Not like paprika, but something else. c.r.a.z.y. “People are NUTS.” Revelation, or yet another validation of what you already knew? Oh, that is my commute every.single.day. It’s horrible. People drive like idiots in vehicles that have no right being on the road. Or they have monster trucks and run everyone off the roads–it’s crazy. About all you can do is drive safely and keep your cool. Glad you are safe after that drive! I’m not a driver, but I do know that if I reported that car, and it’s contents, to the police, that driver would have been in some serious trouble!